Eternal Orthodox Church calendar for the 02.10 year 2017. In the time of the Emperor Probus, in the third century, when Atticus was governing Antioch, two Christians, Trophimus and Sabbatius, both eminent and honoured men, came to that city. Just at that time, there was a pagan festival and offerings to the idol of Apollo in Daphne near Antioch. Atticus made a special effort to ensure that all the citizens took part in the festivities. When someone saw Trophimus and Sabbatius, and told Atticus that these two old men were not taking part, Atticus summoned them for trial, and, when they refused to deny Christ, put them to torture one by one. After beating and torturing Trophimus, he sent him to Phrygia to Dionysius, a yet harsher torturer of Christians, himself taking Sabbatius from prison and trying him. When the torturer asked Sabbatius who he was and what was his rank, he replied: "My rank and dignity, my homeland, my glory and my riches are Christ the Son of God. who is alive for ever and by whose providence the whole universe is held in being." He was therefore beaten and flogged with iron flails until his bones showed through his flesh, and he died under these tortures. The torturer put Trophimus to harsh torture, and held him in prison to inflict yet greater torture on him. Then a certain senator, Dorymedon, a secret Christian, came to the prison and ministered to Trophimus. When the torturer discovered this, he put them both to torture and finally threw them to the wild beasts. But the animals would not touch them. Holy Dorymedon even shouted into the ear of a she-bear to eat him up, but the bear only became even more docile. The torturer ordered, in consequence of this, that Ss Trophimus and Dorymedon be beheaded. 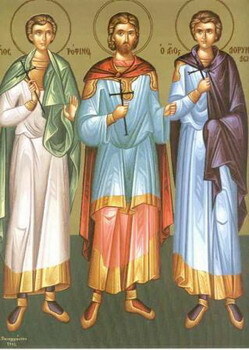 The souls of these holy martyrs now reign in heaven. A Sicilian prince, Dometian, went hunting in the mountains with his servants. In the hills, he saw an old man surrounded by wild beasts that were as tame as lambs. Asked who he was, the old man replied that his name was Zossima, and that he was a Christian and had lived a long time with the beasts, who were better than the persecutors of Christians in the city. 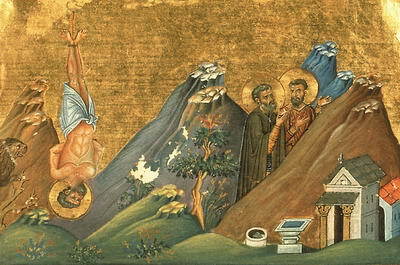 This outraged Dometian, who was himself a harsh torturer of Christians, and he bound Zossima and sent him ahead to Nazareth, to torture him there and thus intimidate those who believed in Christ. When he had wounded him all over and left him bloodied with blows, he tied a rock round his neck and hanged him from a tree. Then the prince mocked at him: "Command a wild beast to come, and we"ll all believe!" 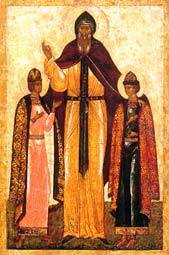 The holy martyr prayed to God, and an enormous lion appeared. Coming up to Zossima, it took the weight of the rock with its head, to ease the martyr. With great fear, the prince freed Zossima, who soon after that gave his soul into the hands of his Lord. A righteous and merciful man, he received the Great Habit at the time of his death, entering into rest in 1298.